The person I am featuring today was an artist of great talent, an avid art collector and an owner of a museum, which housed many of the works he had collected during his lifetime. I talked briefly about him in my previous blog which was dedicated to his friend Jozef Israels. 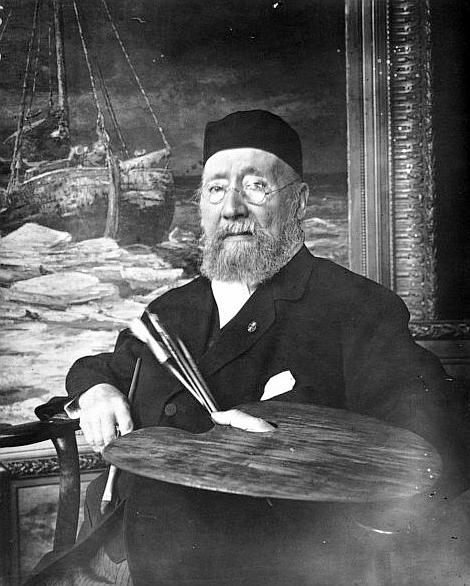 Let me introduce you to the marine painter, Hendrik Willem Mesdag. Mesdag was born in Groningen in February 1831. His father Klaas was a banker and was also active in politics and his mother was Johanna Wilhelmina van Giffen, who came from a wealthy family of silversmiths. She died when Hendrik was four years old. Hendrik had two brothers, Gilles and Taco and a sister, Ellegonda. As schoolchildren, both he and his older brother showed and early artistic talent and their father, who was also an amateur artists, decided to send them for some artistic training. They both received drawing lessons from Bernardus Buijs who had also taught Jozef Israels and later received drawing tuition from Hinderikus Egenberger. However, for Hendrik, once he left school at the age of nineteen, art became just an enjoyable pastime, and his future, like that of his father, lay in banking. Hendrik Mesdag joined his father’s bank where he remained for the next sixteen years. In April 1856, when Hendrik was twenty-five years old, he married Sientja van Houten, who would later become an accomplished artist in her own right. She was one of seven children brought up by a wealthy family. Her father owned a large sawmill just outside Groningen. Her cousin was the renowned painter Lawrence Alma-Tadema. Hendrik’s love of art during his days as a banker did not diminish, in fact in 1861 he enrolled as a pupil at the Academie Minerva, a Dutch art school based in Groningen. In 1863 Sientje gave birth to their son Nicolaas, who was called Klaas. Hendrik’s love of art and his desire to become a full-time professional artist came to a head in 1866 when he decided to give up his work as a banker and concentrate on his art. To give up a lucrative job took courage but it also required funding and for this he had to thank his wife who had received a sizeable inheritance when her father died and she was able to support him financially. Lawrence Alma-Tadema advised Hendrik to go to Brussels to study art and in the autumn of 1866 he goes to the Brussels for three years and studied art under the tutorship of Willem Roelofs, the Dutch painter and watercolourist. Fate played a hand in the artistic life of Mesdag in 1868 when he and his family went to Norderney for a holiday. Norderney is one of the East Frisian islands off the North Sea coast. 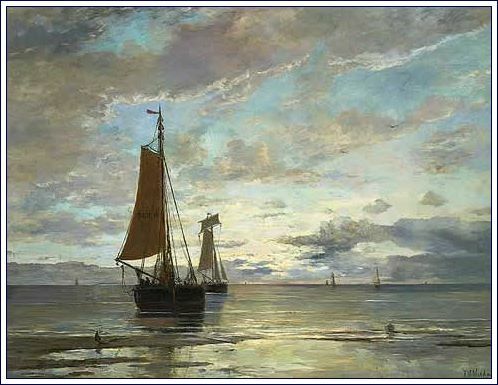 It is here that Mesdag realises his love of the sea and seascapes and when he returns to Brussels he starts collecting paintings which depict the sea and it is from this time that he decides he wants to be a seascape artist. Once he completes his three year study course in Brussels in 1869, the family move to The Hague where the sea views at the nearby coastal village of Scheveningen, would be plentiful. Hendrik was admitted to The Hague’s Pulchri Studio Painters’ Society. The society was formed in 1847 and was a result of mounting dissatisfaction among the young artists in The Hague who complained about their being little or no opportunities for training in art and developing their artistic skills and so the Pulchri Studio was established. It was also to be an artistic talking-shop where artists could exchange views and ideas. 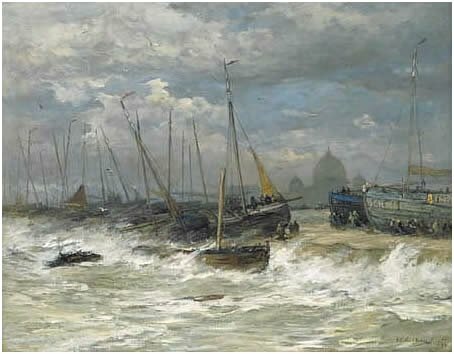 It was in 1869 that Mesdag worked on his painting Les Brisants de la Mere du Nord (Breakers of the North Sea) which, when it was exhibited at the Paris Salon in 1870, was awarded the gold medal. In September 1871, tragedy struck Hendrik and Sentije when their eight year old son Klaas, their only child, died. It was from that time onwards that Sientje took up painting. Hendrik Mesdag’s collection of paintings had grown so large that it filled his house and in 1878 he decided to build a museum in the garden, next to his house, to accommodate his ever-growing collection. That same year, his father Klaas died aged 85. Although most of the works of art by Hendrik Mesdag were seascapes and paintings depicting bomschuiten (fishing boats) one of his most famous works came about in 1879 when he received a commission from a group of Belgian entrepreneurs to paint a panorama. A panorama or panoramic painting was a massive work of art, which depicts a wide and all-encompassing view of a particular subject. They could be depictions of a battle, historical event or a landscape and were very popular in the nineteenth century, a time before television or the cinema. The commission was simple – the group wanted Mesdag to complete a painting without any borders ! The Belgians gave Mesdag free rein on the subject of the panorama and he was allowed to pick his team of artists to complete the task. 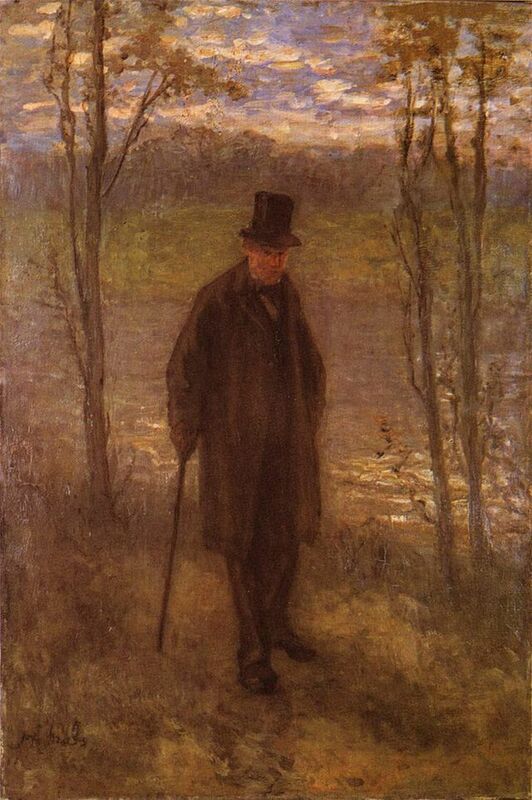 The commission intrigued Mesdag and he agreed to it and formed a team of artists which included Théophile de Bock and twenty-three-year-old George Hendrik Breitner, who was still a student at The Hague Academy , the artist, Bernard Blommers , as well as his wife Sientje. 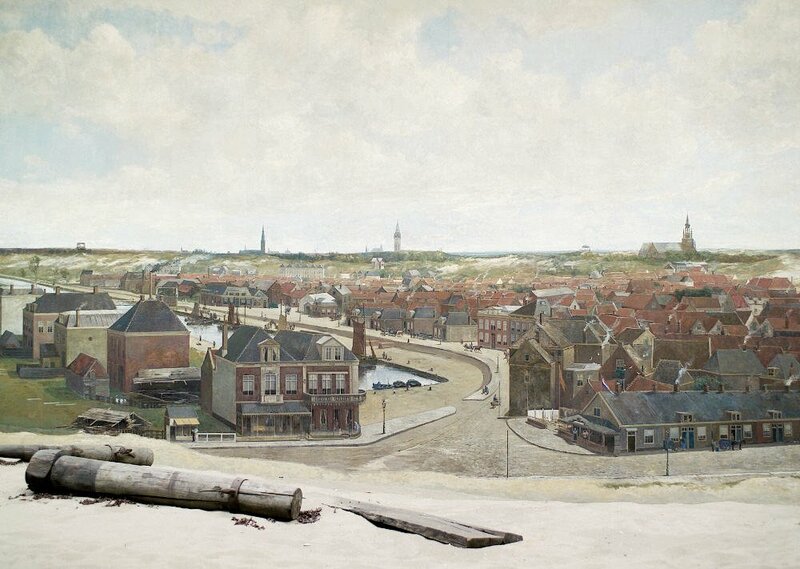 Mesdag decided this was an opportunity to depict his beloved coastal village of Scheveningen. In March 1881, Mesdag and his team of painters set to work on the panorama. They made numerous sketches of the town and the surrounding coast and slowly over the next four and a half months the panorama often referred to as Panorama Mesdag evolved. The work when completed was 14 metres high with a circumference of 120 metres, a square footage of 1600 square metres. The finished work was housed in a purpose-built museum in The Hague and could be viewed from an observation gallery in the centre of the room. When one stood at this central observation point, it was if one was standing on top of a high sand dune and one could observe the sea, the beaches and the coastal village of Scheveningen. The museum housing the panorama was opened to the public on August 1st 1881 but after five years it went bankrupt. Mesdag , who was concerned as to the fate of his panoramic painting, bought the museum and kept it open despite it losing money year on year. It is still open to the public and it is still one of the The Hague’s greatest tourist attractions. 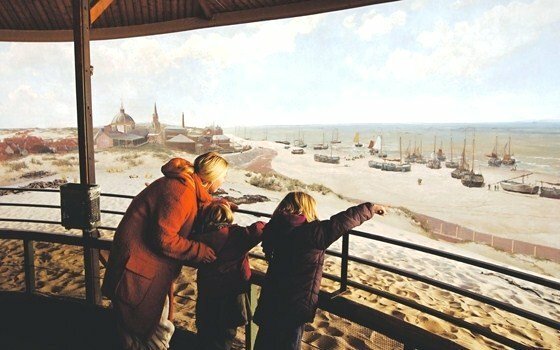 Can you imagine what it would be like to stand on that central observation platform – take a look now at http://panorama-mesdag.nl/ and see this wonderful work, which is the largest circular canvas in Europe. 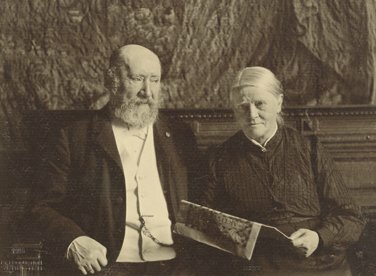 In his later years Mesdag received many honours. 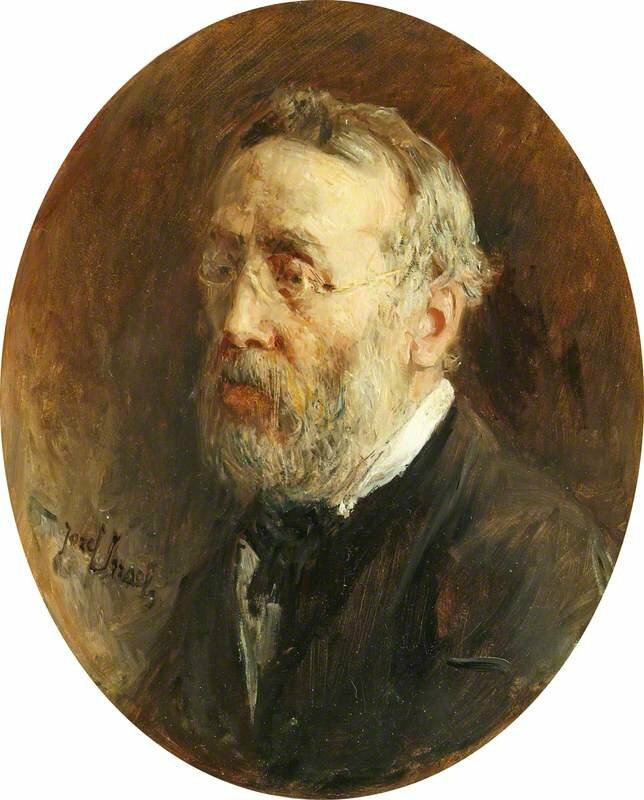 In 1889, he was elected chairman of Pulchri Studio Painters’ Society, the society he joined twenty years earlier, and remained in that post until 1907. He received the royal distinction of Officer in the Order of Oranje-Nassau in 1894. In February 1901 Mesdag is promoted to Commander of the Order of the Dutch Lion. In March 1909 his beloved Sientje died, aged 74. Two years later in 1911, Hendrik Mesdag is taken seriously ill and although he recovers, his health slowly deteriorates. 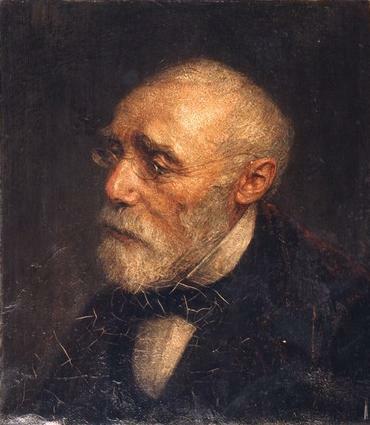 Hendrik Willem Mesdag died in The Hague in July 1915, aged 84. I ended my last blog, which looked at the life of Jozef Israels, around 1856 when he was living in the small fishing town of Zandvoort and spent much of his time sketching and painting scenes involving the local fishing community. Israels left the coastal area around 1858 and returned to Amsterdam where he remained until 1870. 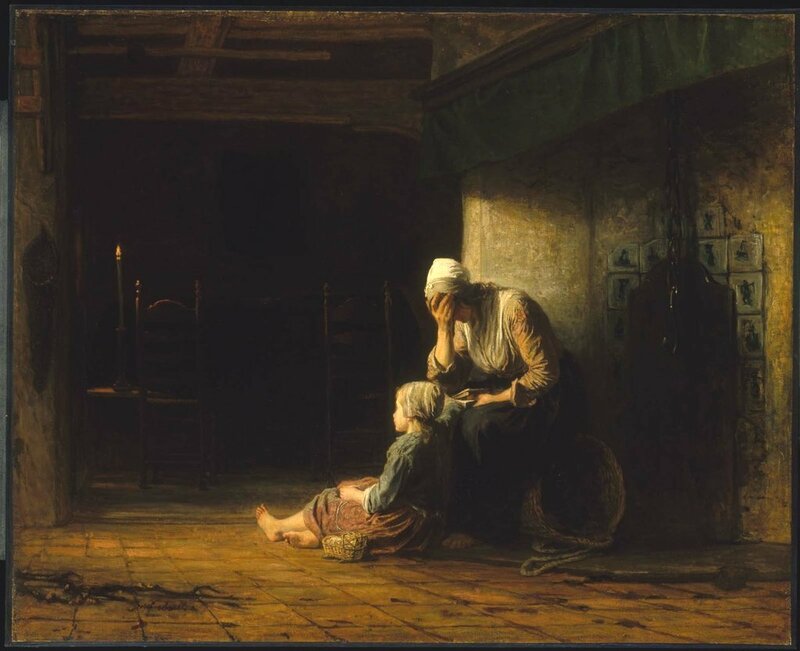 In 1860 he completed a work entitled De dag voor het schieden (The Day before the Parting), which can now be found in the Museum of Fine Arts in Boston. It is a beautiful soulful depiction. It is a depiction of sadness. But why the sadness? Is it like the paintings depicting families waiting for their fisherman husbands and fathers to return from the hazards of the sea? Actually it is not, it is about death. The setting is the interior of a cottage. In the dimly lit background there is a coffin which lies across two chairs. The wooden coffin is covered with a pall and is barely illuminated by a solitary candle. Light streams into the room from the left and illuminates the two characters featured in the work. The lighting of the foreground is in stark contrast to the background. It was the artist’s clever use of chiaroscuro (the strong contrast of light and dark), which in some ways was a contrast between life and death. 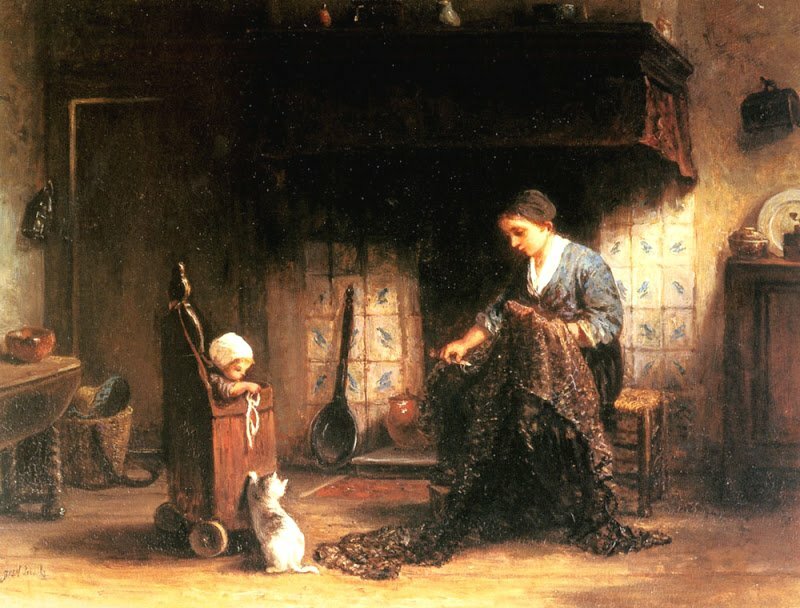 In the foreground we have the mother leaning against the chimney breast as she sits on a chair, besides her in the fire hearth lies an empty overturned wicker log basket. Her face is red from all the tears she has wept. She leans forward and rests her face on her right hand whilst her left hand clutches hold of a book, probably the bible and her thumb keeps the place of the passage she was reading. On the floor, at her feet, sits a young girl. She leans against her mother to get comfort. Her right hand lies across her mother’s knee. She stares at the coffin. Her left hand lies in her lap, grasping the loop of the cord attached to her toy cradle which lies by her side. 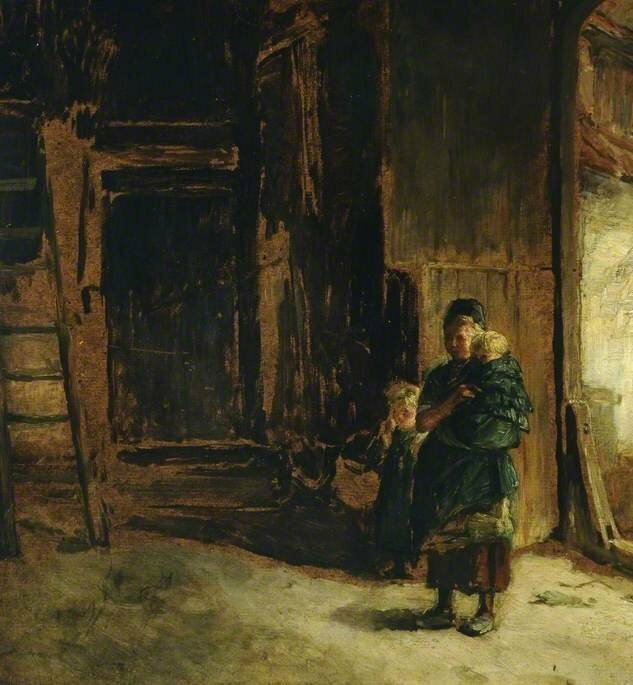 This painting is not only a depiction of sorrow it is a depiction of poverty. The mother and daughter do not wear shoes despite the coldness of the red-tiled floor. The fireplace, with its blue surround tiles, is empty and so too is the wicker log basket indicating that they have no fuel for the fire. The large black chain over the fireplace which would hold pots or a kettle for food and drink hangs idly. Have they food? Jozef Israels moved to The Hague in 1870 and here he began to associate himself with The Hague School of Painters. 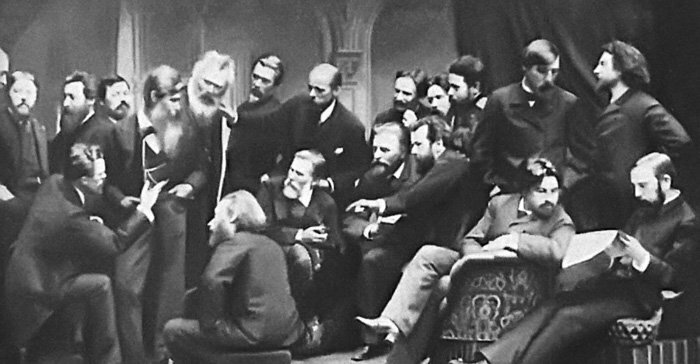 This group of artists were active between 1860 and 1890. For these artists reality was the key to their work, not idealised reality but depicting true reality, warts and all. The colours used by these artists was often gloomy and sombre and consisted mainly of various tints of grey, so much so they were often termed the Grey School. This only changed in the latter years of the School with the influence of the Barbizon painters and the early Impressionists who instilled a lighter and brighter palette. During his lifetime, Jozef Israels was one of the most famous living Dutch artist and earned the nickname ‘the Dutch Millet.’ The two artists saw in the life of the poor and humble peasants a motive for expressing with peculiar intensity their wide human sympathy. Millet’s depictions of peasant life were much lighter in tone and were simply a look at peaceful rural life. For Israels it was different, his depictions of peasant life was very much more sombre and carried a message of hardship and despair. The French novelist and art critic, Louis Edmond Duranty who was a great supporter of the realist cause said Israels’ depiction of peasant life was painted with gloom and a sense of anguish. The setting for the painting, Alone in the World, is the inside a sparsely furnished bedroom of a peasant’s cottage. There is an air of bleak despondency about the scene we see before us. A man sits on the side of a bed. His bony workman’s hands rest on his knees, his posture is unmoving. He is wracked by sadness as his wife has died despite all he had done for her. Her body lies in the half-light which streams in from the left of the painting on to the bed and also illuminates the table on which are a pitcher of water and an empty glass as well as the bed. The greyish colour of the dead woman’s skin makes her almost indistinguishable from that of her bedclothes. It is interesting to note that Jozef Israels and Sientje Mesdeg talked about this work years after its completion and on a broader aspect of art. They considered the anecdotal aspect of art and whether genre paintings should tell a tale. They failed to agree. Sientje was adamant that there was never a need for art to tell a story, whereas Jozef Israels countered saying that a “felt” work is good even if badly delineated. There is no doubt that this work is a “felt” work as we, the observers, can understand the feelings of the man at a time of his great loss. 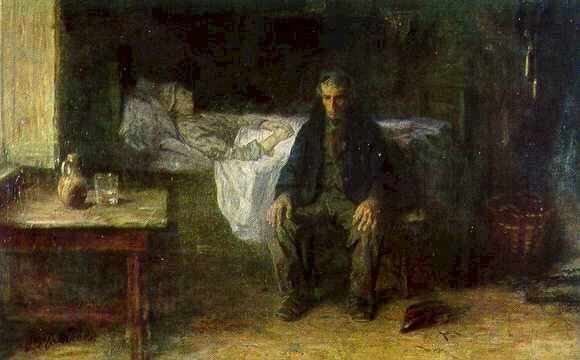 A painting I really like which combines the reality of illness and sentimentality is Israels 1871 work entitled Convalescent Mother and Child. 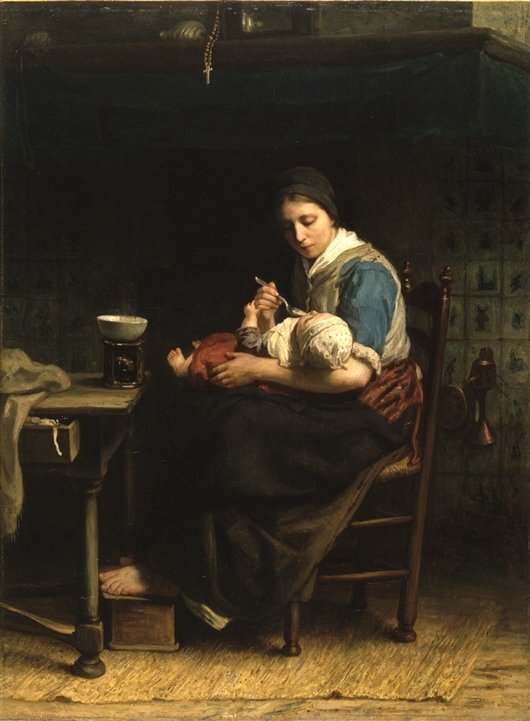 In the painting we see a mother slumped in a chair, head lolled to one side, her knitting lies abandoned in her lap. Walking towards her is her barefooted young child struggling to carry a small table towards her. The child is trying to be a help to his sick mother. Look at the concentrated expression on the child as he makes a great effort to move the table towards her. 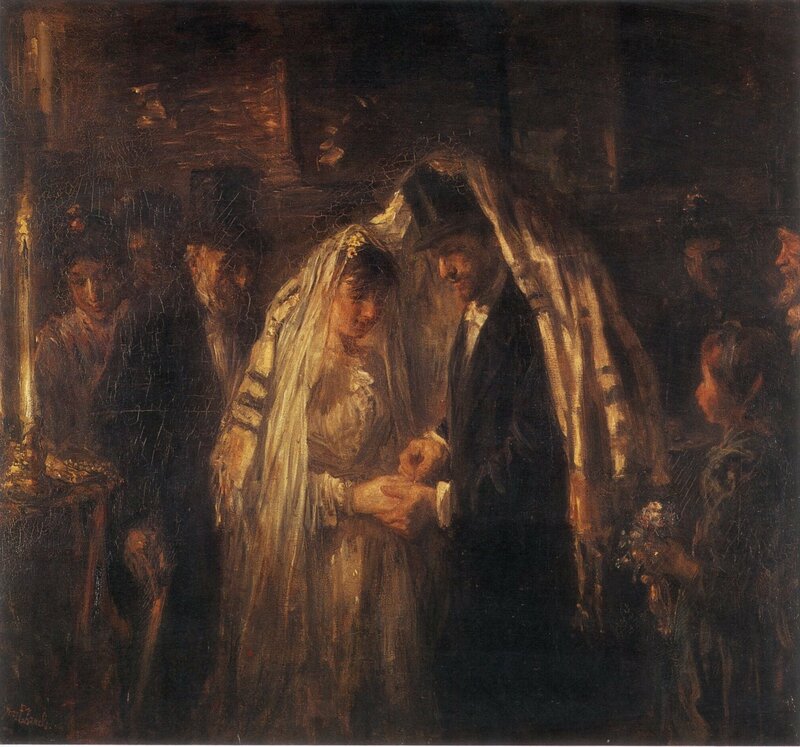 In later years his paintings were influenced by the works of Rembrandt and this next work of art, entitled The Jewish Wedding, is a fine example of this. Jozef Israels was a committed orthodox Jew and his mother had once hoped that he would become a Rabbi. He produced a number of paintings depicting Jewish ceremonies. Here before us we see bride and groom under the chupa in the ceremony of sanctification of the joining together of the couple in marriage, surrounded by family and wedding guests. The couple in the painting are depicted in bright sunlight which was a symbol of the happiness of the occasion. Joseph Israels died in Scheveningen in August 1911. aged 87. 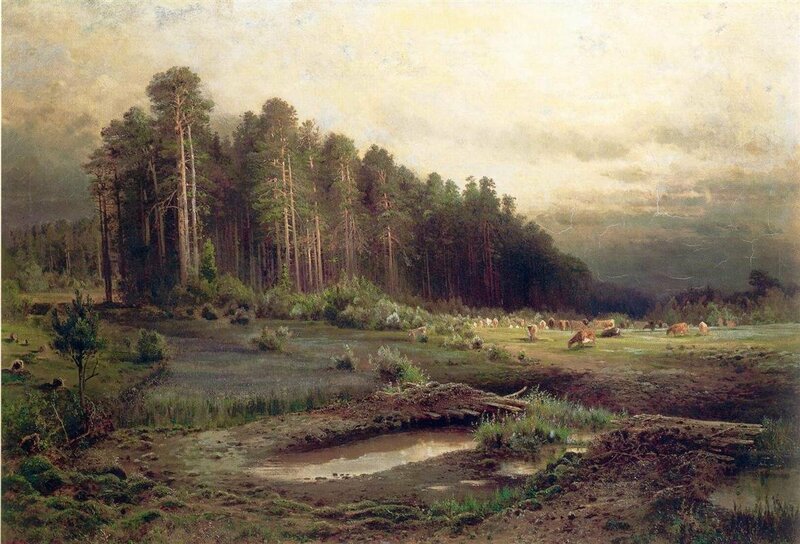 My previous three blogs looked at Russian landscape painters and although they were leading exponents of this 19th century genre they may have been unknown to many people nowadays. The artist I am looking at today is probably also not known by most people but he had a great influence of the early works of the Dutch master, Vincent van Gogh. Just before Christmas I went to Amsterdam to visit the newly refurbished Van Gogh Museum and I suggest that it is “must visit” museum for any travellers to the Dutch city. The museum was awash with colour from Van Gogh’s landscape paintings but I was fascinated by his darker early works and his fascination with the hard-working peasants and I wanted to know more about what influenced him to spend so much of his early life concentrating on depictions of the peasant class. 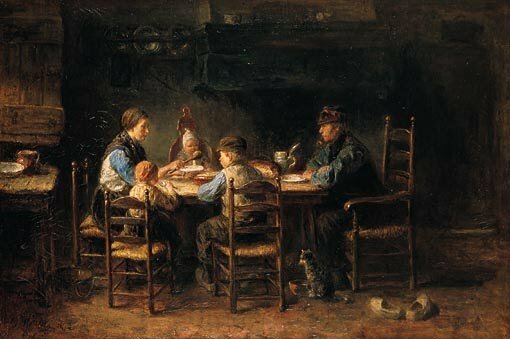 It was then I came across Jozef Israels and his 1882 painting entitled Peasant Family at the Table, a work of art which led to a similar depiction, by van Gogh, of peasants sitting around a table having a meal which is entitled The Potato Eaters and I featured this work of art in My Daly Art Display (Feb 7th 2012). However this blog is not about Van Gogh but the Dutch artist, Jozef Israels who influenced him. 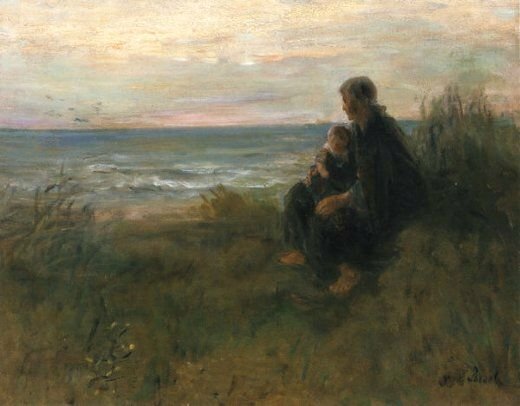 In this first blog about Jozef Israels I want to look at his paintings depicting the harsh life of fishermen and their families. Josef Israels was a Dutch Jewish painter born in Groningen in January 1824. His father was to Hartog Abraham Israel, a professional broker and merchant who had married Mathilda Solomon Polack. Jozef was the third-born of ten children and he had six brothers and three sisters. As is the case of many young aspiring artists, Jozef’s father did not see his son’s future as an artist but wanted him to carry on the family business and it was only after a long struggle and great determination that Jozef persuaded his father to let him study art. It was a compromise, as during his artistic studies he worked as a stockbroker’s clerk in his father’s business. At the age of eleven he received his first drawing lessons from the landscape artist J. Bruggink who worked at Minerva Academy in Groningen and a year later became a pupil of Johan Joeke Gabriel van Wicheren. In 1838, aged fourteen he was tutored by the Groningen painter, Cornelis Bernudes Buys. In 1842, shortly after his eighteenth birthday Jozef went to Amsterdam to study drawing under the tutelage of Jan Adam Kruseman and, in 1844, attended art classes at the Amsterdam Royal Academy of Art. Kruseman had made his name as a painter of historical, biblical and genre scenes but was probably more famous for his portraiture. In 1845 Jozef Israels left his native Netherlands and travelled to Paris where he worked in the studio of the neo-classical history painter, François-Édouard Picot. Picot was one of the artists who was favoured by the French rulers of the time. He was an esteemed artist who taught many of the aspiring artists of the time such as Alexandre Cabanel and William-Adolphe Bouguereau. His romantic historical paintings influenced Israels. The Romanticism genre of Louis Gallait and Ari Scheffer also left their mark on the twenty-two year old. During his stay in Paris he attended classes at the Ecole des Beaux-Arts presided over by such artistic luminaries as James Pradier, Horace Vernet and Paul Delaroche and he would spend time at the Louvre where he copied the works of the great Masters. The Academies at the time pushed the genre of paysage historique, historical landscape painting depicting idealised landscape works of art with their historical connotations. This art genre went back to the 17th century Baroque era of Nicolas Poussin and Claude Lorrain and aspiring landscape painters from the Academies made their way to Italy to paint their landscapes interspersed with historical monuments, the settings of which were favoured by the dazzling Mediterranean sunlight. This favourable Italian climate had given the artists the chance to paint en plein air. However, Jozef Israels, whilst he was living in the French capital, delved into the alternate world of landscape painting, the world of Realism, and the works of the Barbizon painters some of whom he had the chance to meet. For them it was the landscape which was the beauty in itself and did not require the addition of mythological or biblical figures. If figures were to be added it should be those of hard working peasants whose inclusion added reality to the work and dispensed with romanticism. However Jozef Israels was not sold on their ideas for landscape painting and soon reverted to his painting which were more likely influenced by the painter Ari Scheffer (see My Daily Art Display May 15 2012 and Sept 30th 2014) depicting subjects from Romantic poetry or influenced by the work of the Belgian history painter, Louis Gallait and depicted figures from Dutch national history. In 1847 Israels returned to Holland and his work concentrated on his portraiture and historical subjects, often with Jewish themes. The problem for Israels was that by the 1850’s, the genre of history paintings in the Netherlands was falling from favour and he realised that to sell his art he needed to think of a different painting genre. Fate took a hand as Jozef was taken ill and in 1855, as a cure for his health problems, he moved out of the city and went to live in the small fishing village of Zandvoort, where he believed the sea air would aid his recovery. He immersed himself in the local village life and became aware of the hard life endured by the village’s fishing community and he decided to record some of their sufferings in his works of art. His paintings depicted the hard life of the fishermen and their families and the unforgiving nature of the sea. 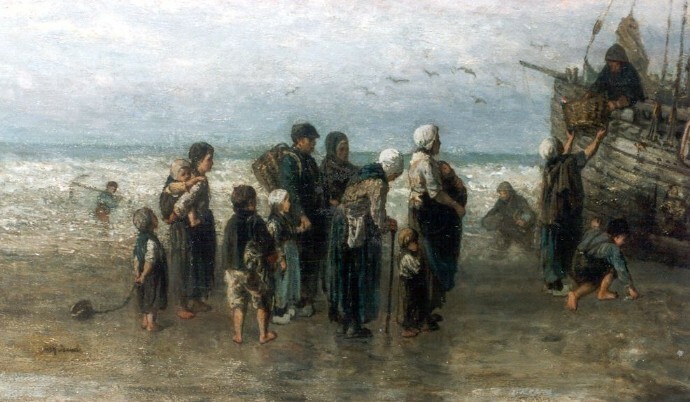 In 1856 he painted one of his most famous works featuring Zandvoort fishing folk. It was a life-size work measuring 224cms x 178cms entitled Passing Mother’s Grave. The painting depicts a fisherman passing his wife’s grave. He walks hand in hand with his son whilst carrying his baby daughter. The bare-footed trio alluded to the poverty of the fishing folk and for this trio life without the woman had added to their problems.The work is housed in the Stedelijk Museum Amsterdam. 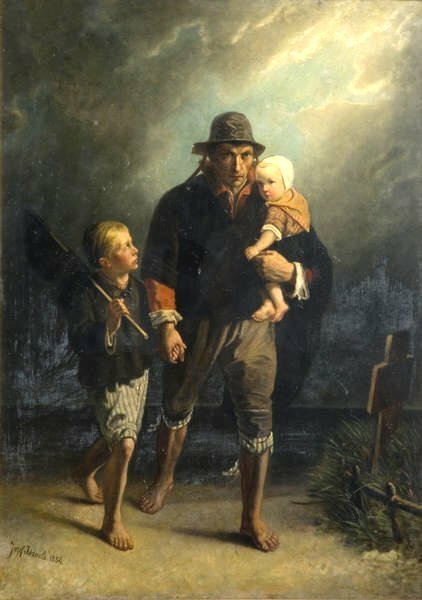 Another work of art featuring the plight of fishermen and their families was Jozef Israels’ painting entitled Fishermen Carry a Drowned Man which is housed in the National Gallery in London. 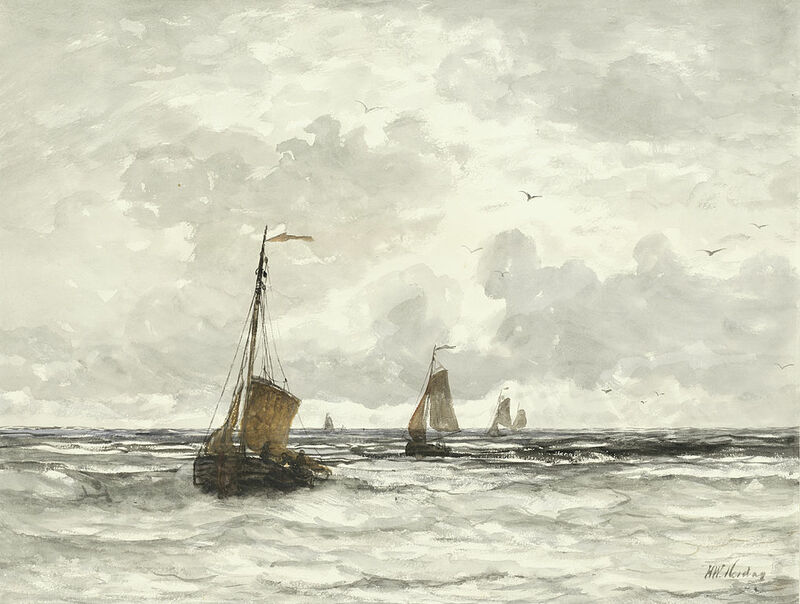 It is thought that this work was completed around 1861, sometime after Jozef returned to Amsterdam from Zandvoort but used sketches he had made whilst living in the fishing village. The work is all about suffering and the hard life experienced by fishermen and their families and it was this eking of sympathy from the observer which was so like that of Jean-François Millet and his peasant paintings. Let’s look at this sombre work with its dark grey skies. A line of fishermen and their family trudge up the dunes from the shore. A grief-stricken woman leads the way with her two children at her side. They too are aware of the loss. Maybe the woman is the widow of the dead fisherman. She is leading the line of mourners. Behind her the body of the dead fisherman is carried by two burly men whilst to the left of them is a weeping woman. 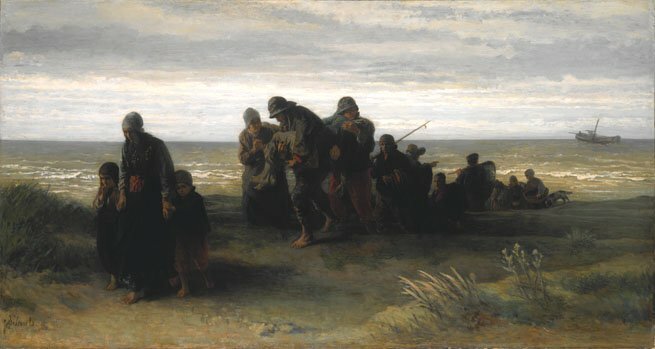 The dead man’s companions follow on carrying the fishing equipment from their boat. The work of art was exhibited at the 1861 Salon and in 1862 at the London International Exhibition and was hailed a triumphant success. The third painting by Jozef Israels with this fishing/sea-going motif is entitled Anxiously Waiting. Once again observers of this work can empathize with the woman we see sitting on the dunes looking out to sea. On her knee sits her baby child. She is bare-footed which tells us of her and her family’s financial state. The sky has an orange hue indicating an oncoming storm. We see the white crests of the waves which signify the wind is beginning to increase in its ferocity. Her husband has left home in the fishing boat and has yet to return and she anxiously awaits sight of his boat. In his painting Unloading the Catch we see that fishing was not just about the men that went to sea but the wives, parents and children who needed to help, notwithstanding their age or their state of health. Look at the line of helpers. An elderly woman bent over supporting herself with her cane, a man with a basket over his shoulder holding the hand of his daughter, two mothers carrying their babies , all have to help with the unloading of the day’s catch from the beached fishing boat. In a number of his paintings he liked to connect the wives of the fishermen and the sea, the workplace of their husbands and fathers. In most it was the about the wife, worried about the safety of her husband, and the prospect of him not returning home safely. 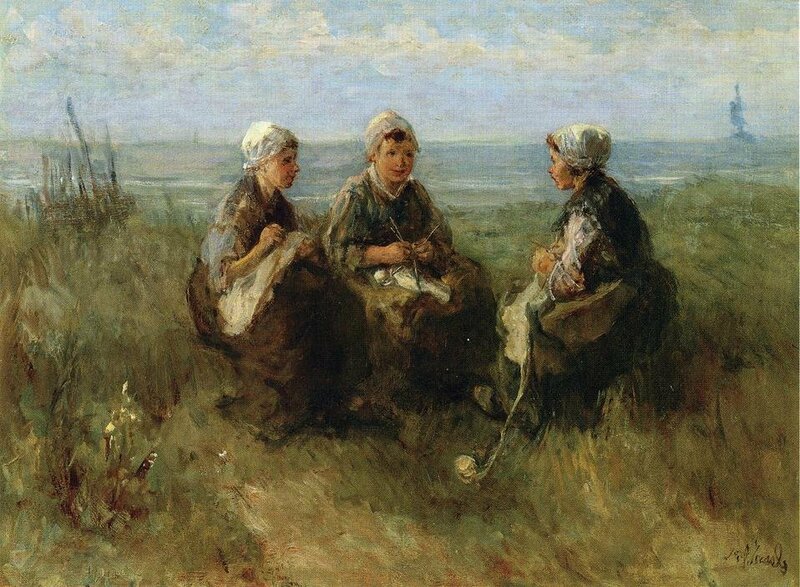 A painting by Jozef Israels with a lighter mood was his work entitled Three Women Knitting by the Sea. In the background we see a fishingboat at sea ,whilst in the foreground, we have the three ladies happily chatting away as they knit. 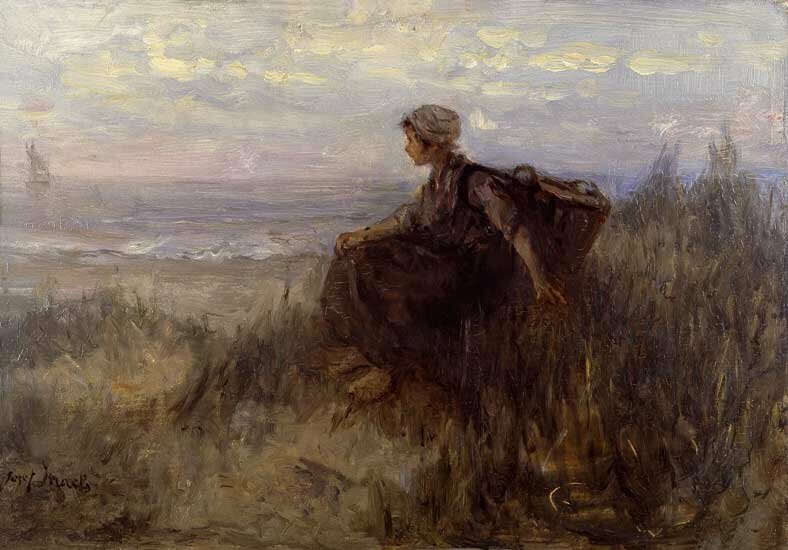 In his work On the Dunes we see a familiar depiction of a woman sitting on the dunes looking out to sea. On her back is her empty basket which, once the boat has landed with its catch, will be filled with fish which she will have to carry back to the village. Her wait will not be long as on the horizon we catch sight of the returning fishing boat. The sky is light and the sea is calm and for this day her beloved will return home safely. An insight into the domestic life of a fisherman’s wife can be seen in his painting Mending the Nets. The scene is the interior of a cottage. 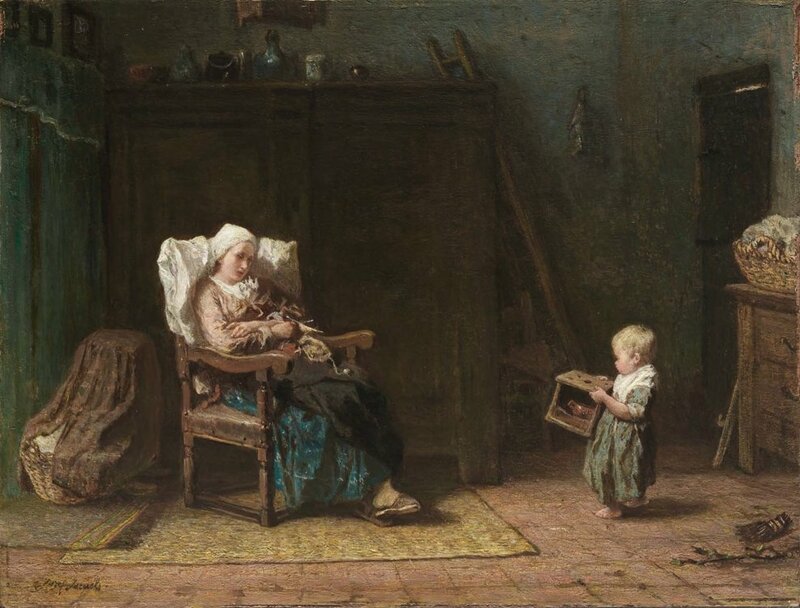 A mother sits before a tiled fireplace mending her husband’s fishing nets whilst her young child sits in a wooden forerunner to today’s baby buggy. The baby looks over the side at the cat which she tantalises with a strand of wool. In my next blog I will look at some more of the paintings by Jozef Israels, in which he depicted peasant life and I will conclude his life story. My last two blogs featured the life and works of the great nineteenth century landscape painter, Isaac Levitan. Whilst I was researching his early life as a student at the Moscow School of Painting, Sculpture and Architecture I came across the name of Alexei Kondratyevich Savrasov who was one of Levitan’s tutors. Having a rest from writing about Levitan, I had a look at some of the works of Savrasov, who had influenced Levitan and amongst them I came across the most exquisite painting and the one Savrasov was probably most famous for; but more about that later. Alexei Savrasov was born on 12 May 1830 into the family of a Moscow merchant. As a young boy he developed the love of drawing and by the age of twelve he was experimenting with painting gouache and watercolour landscapes and during his early years he managed to exchange his paintings with vendors for chicken feed. He persuaded his father to let him study art and at the young of eight he attended the painting school. In 1844, when Savrasov was fourteen years of age, and plans for his future career had to be discussed with the family. His father was adamant that his son should follow him and become a merchant and thus end all the time his son spent painting which his father regarded as just a hobby. However for Alexei, his heart was set on becoming an artist. Alexei eventually had his way and enrolled at the Moscow School of Painting, Sculpture and Architecture and in 1848 he was fortunate to join the special studio of perspective and landscape painting which was run by Karl Rabus, who was the Professor of Landscape painting. Alexei loved the genre of landscape painting and began to specialise in it. 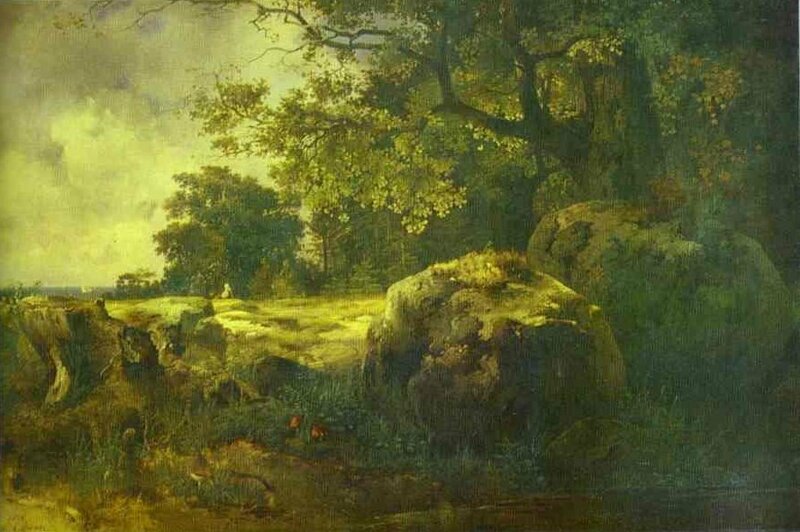 Soon he was widely acknowledged by the tutors as the best student of landscape painting in the School. During the last years at the painting school, Savrasov, received a bursary from a well-known Moscow art patron and member of the Moscow Art Society, Likhachev, which enabled him to go on a painting and sketching trip to Odessa, where he captured the beauty of the local landscape. In 1850 Savrasov graduated from the Moscow School of Painting receiving the official title of “unclassed artist”. One of the first paintings Savrasov completed after leaving the art school was entitled View of the Kremlin from Krymski Bridge during Inclement Weather. The storm clouds rush from the right to the left of the painting pushed relentlessly by the strong winds which have caused the branches of the trees to bend towards the river. 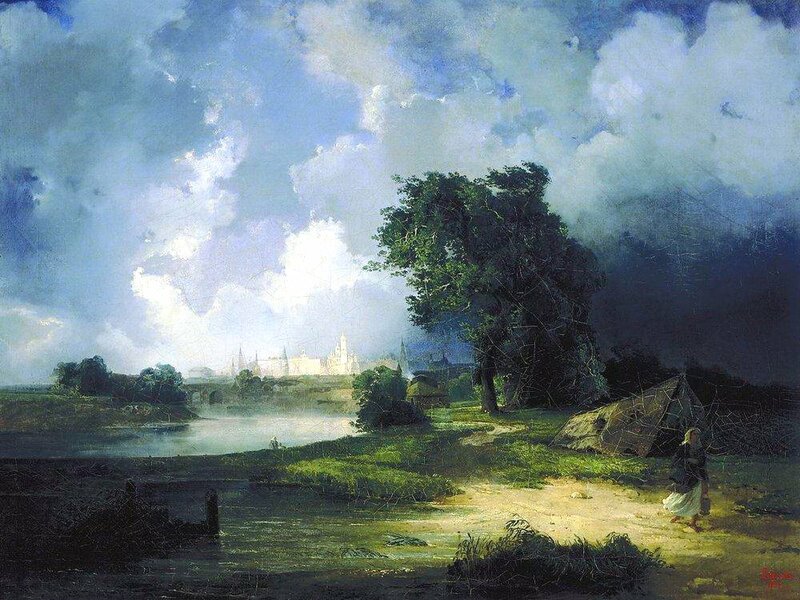 The sun has pierced the clouds and illuminated the Kremlin in the background of the painting. In the foreground of the painting we see that the sun has lit up a small patch of land where the water from the Moskva River laps the sandy ground. A woman, pail in hand, rushes past. Her hand clutches her coat to hold it closed while the wind whips at her skirt which is billowing in the gale. Savrasov travelled to the Ukraine in 1852 and steadily built up a portfolio of sketches and paintings and with them he started to develop a reputation as an up and coming artist. Two years later, in 1854, he received a painting commission for several works of art for the Russian Art Academy from the Grand Duchess Maria Nikolayevna, She was one of the daughters of Emperor Nicholas I of Russia. She was an avid and well-known art collector and President of the Russian Academy of Arts in St Petersburg. To carry out his commission, Savrasov moved from Moscow to the Gulf of Finland, close to St Petersburg. 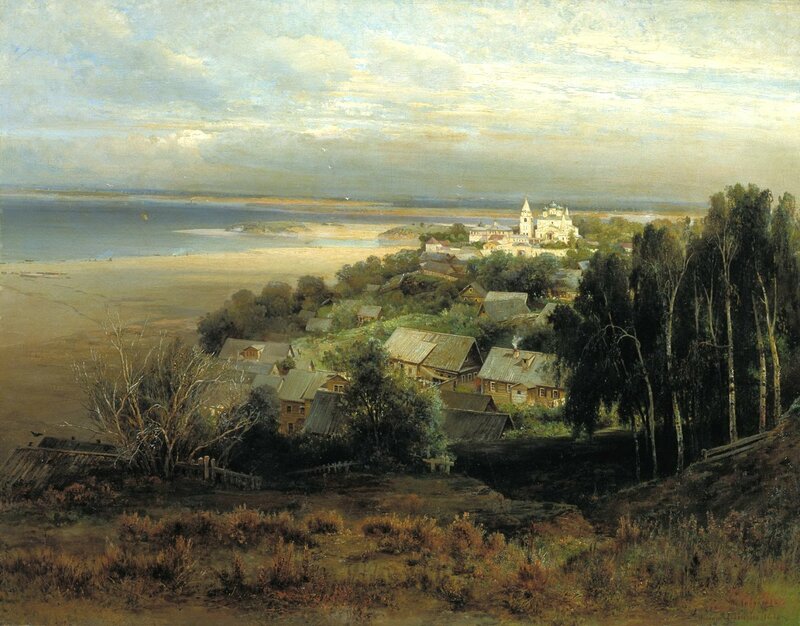 Two of the paintings he produced, View in the Neighborhood of Oranienbaum and Seashore in the Neighborhood of Oranienbaum, are now looked upon as excellent examples of the genre known as romantic landscapes These works of art by Savrasov allowed him to depict, with great fondness, the charm and appeal of a summer evening at the sea, with the moistness associated with the sea air in the shade of ancient rocks, whilst envisioning the twilight which we observe under the spread­ing branches of trees. The works Savrasov produced during this period, and these two works in particular, earned him the title of Fellow of the Russian Art Academy. Alexi Savrasov had studied at the Moscow School of Painting, Sculpture and Architecture for ten years from 1844 to 1854, some of the time under the tutorship of Karl Rabus. When Rabus died in 1857 Savrasov was asked to take over Rabus’ landscape class which he did and remained in post until 1882. During his tenure he took many students under his wing, including the subject of my last blog, Isaac Levitan. Savrasov was an excellent teacher and much loved and admired by his students. In 1857 Savrasov married Sophia Hertz, the sister of art historian and archaeologist, K. Hertz; the couple went on to have several children. 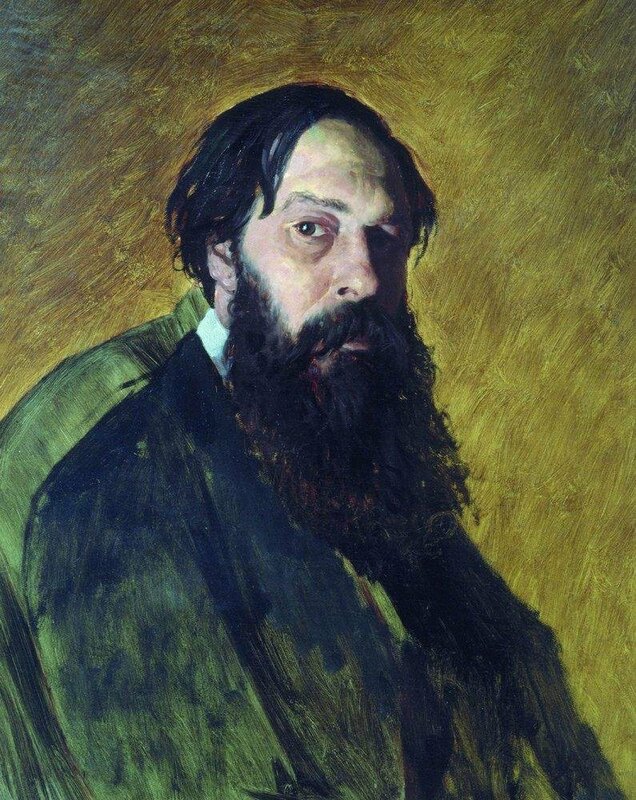 In their home they entertained artists and collectors including the famous art collector and patron of the arts, Pavel Tretyakov, who gave his name to the Moscow Art Gallery. On the way back home he visited Paris, Switzerland, Copenhagen, Berlin, Dresden, Leipzig. During his European travels the two landscape painter whom he admired the most were the English artist, John Constable and the Swiss landscape painter Alexandre Calame. One of the paintings he completed in 1862 originated from his travels through Switzerland. 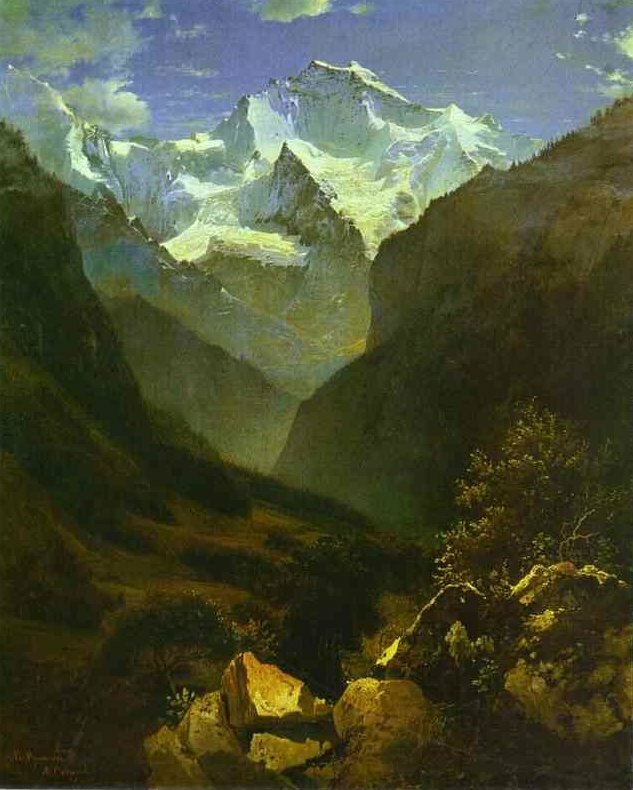 It was entitled View of the Swiss Alps from Interlaken and was completed in 1862. I particularly like his painting entitled Rafts which he painted in 1868. 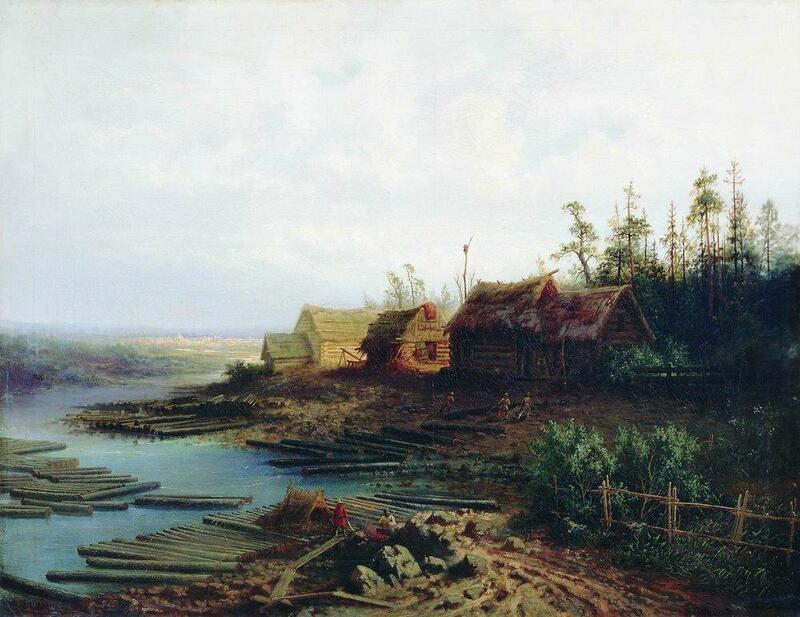 However the painting of his which drew the most acclaim in this period was a beautiful landscape work entitled Elk Island in Sokolniki, which he finished in 1869 and for which he was awarded the first prize at a painting competition organised by the Moscow Art Amateurs’ Society. Elk Island straddles the boundary between the centre of Moscow and its suburbs to the north of the city. It is home to a remarkable variety of animal and plant life. The area was believed to have been a favourite place for Ivan the Terrible to enjoy falconry and bear-hunting. The area was given the name Elk Island in the early 17th century, when documents say that the place was used for hunting “all manner of game birds, and especially elk”. In December 1870 Savrasov, his wife and family went to live in Yaroslavl which lies on the Volga, three hundred kilometres north of Moscow. Whilst there he produced the beautiful work of art entitled Caves Monastery near Nizhny Novgorod, which is now housed in the Gorky State Art Museum in Nizhny Novgorod. It was one of the largest canvases Savrasov ever painted. The left hand side of this wide panoramic view is taken up by the confluence of the Oka and Volga Rivers with the blue lagoons whilst the right hand side of the painting depicts the Pechersky Voznesensky monastery. The original monastery is believed to have been founded around 1330 by St. Dionysius, who, along with several followers, arrived in Nizhny Novgorod from Kiev Pechersk Lavra also known as the Kiev Monastery of the Caves, (pechery meaning ‘caves), hence the title of the painting. On arrival at Nizhny Novgorod they dug a cave on the shoreline of the Volga and later it became the site of a monastery and church. The original monastery was destroyed by a landslide in 1597; but in the same year a new monastery was built a short distance upstream. In the right foreground, we see suburban homes with their small gardens awash with greenery which contrasts with the towering white stonework of the monastery. The last work of Savrasov, which I am showcasing, is the one I talked about at the start of this blog. Its beauty and simplicity immediately struck me and I was reminded of one of my favourite artists Pieter Breugel the Elder who had a propensity of including rooks or magpies in his winter scenes, such as his 1565 painting The Hunters in the Snow. This painting by Savrasov entitled The Rooks have Come Back was completed in 1871 at the height of his artistic career. 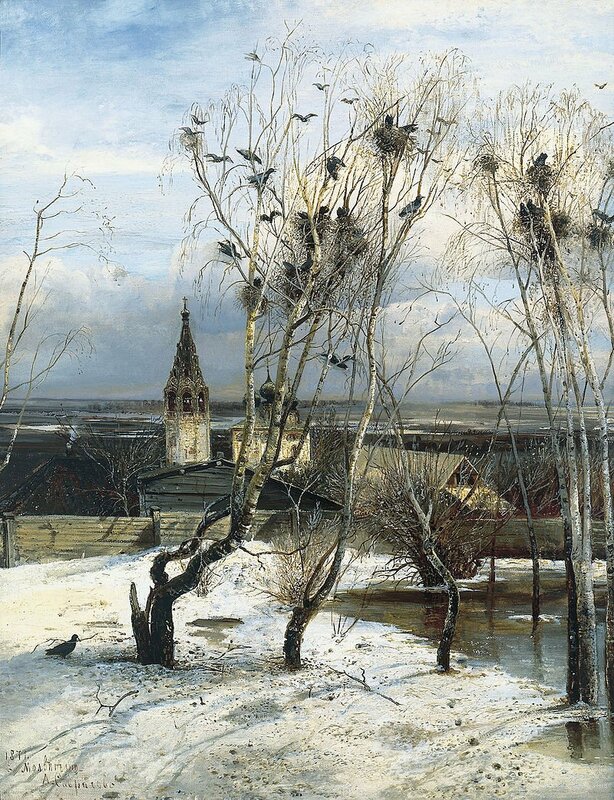 “…The Rooks Have Come Back was the best he’d ever seen; and despite the fact that there were similar landscapes painted by other renowned Russian artists, only “The Rooks” mirrored the artist’s soul. Although the year 1871 and this painting marked the height of Savrasov’s fame it also marked the beginning of the end of the great man for in February 1871 Savrasov’s life took a tragic turn with the sudden death of his baby daughter. This was the third child he and his wife had lost. Maybe it was “the straw which broke the camel’s back” as Savrasov never recovered from this loss and descended into deep depression and despite friends who tried to help him he took to alcohol to ease the pain.. His work suffered and by 1882 he could no longer hold down the post of professor at the Moscow Art School and was sacked. His wife eventually left him and took their children with her, His bad manners and unpleasant demeanour caused friends and family to eventually desert him and his alcoholism and lack of sales of his work culminated in the 1880’s with him living the life of a pauper. In 1890 Savrasov went to live with Evdokiya Morgunova, and the couple had two children. Alexei Savrasov died in September 1897 in a city hospital, in a ward for paupers. 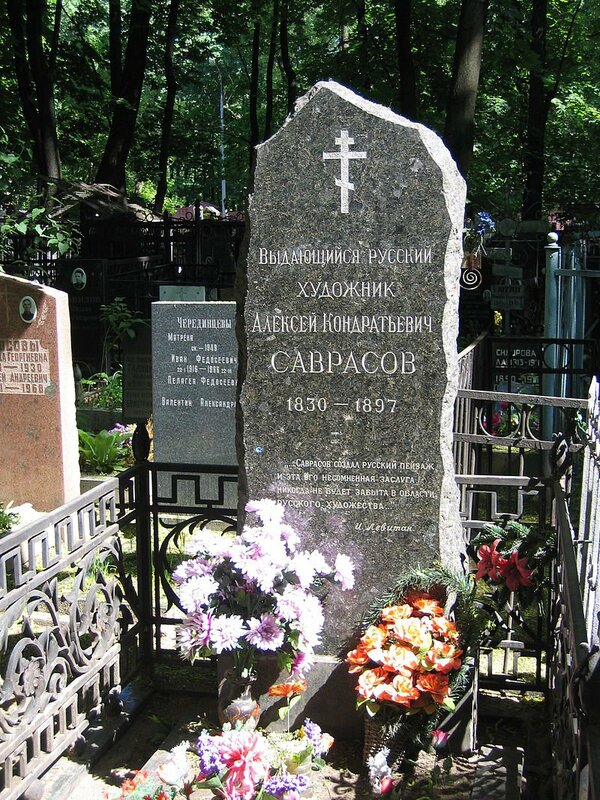 When it came to his funeral, the doorkeeper of the Moscow School of Painting, Sculpture and Architecture and Pavel Tretyakov, who later founded the Tretyakov Gallery in Moscow, were the only people to attend Savrasov’s funeral .